In many ways, Google is the prototype of a successful twenty-first-century company. It uses technology in new ways to make information universally accessible; promotes a corporate culture that encourages creativity among its employees; and takes its role as a corporate citizen very seriously, investing in green initiatives and developing the largest corporate foundation in the United States. Following in the footsteps of Warren Buffett Speaks and Jack Welch Speaks—which contain a conversational style that successfully captures the essence of these business leaders—Google Speaks reveals the amazing story behind one of the most important new companies of our time by exploring the people and philosophies that have made it a global phenomenon in less than fifteen years. 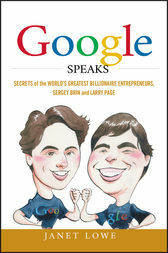 Written by bestselling author Janet Lowe, this book offers an engaging look at how Google's founders, Sergey Brin and Larry Page, transformed their vision of a better Internet search engine into a business colossus with about $16 billion in annual revenue. Lowe discusses the values that drive Brin and Page—for example, how they both live fairly modest lives, despite each having a net worth in excess of $15.9 billion—and details how they have created a culture that fosters fun while, at the same time, keeping Google at the forefront of technology through relentless R&D investments and imaginative partnerships with organizations such as NASA. In addition to examining Google's breakthrough business strategies and new business models—which have transformed online advertising and changed the way we look at corporate responsibility and employee relations—Lowe explains why Google may be a harbinger of where corporate America is headed. She also addresses controversies surrounding Google, such as copyright infringement, antitrust concerns, and personal privacy and poses the question almost every successful company must face: as Google grows, can it hold on to its entrepreneurial spirit as well as its informal motto, "Don't do evil"? What started out as a university research project conducted by Sergey Brin and Larry Page has ended up revolutionizing the world we live in. Google Speaks puts these incredible entrepreneurs in perspective and shows you how their drive and determination have allowed them to create one of today's most powerful companies. JANET LOWE is the author of the bestselling Warren Buffett Speaks, Jack Welch Speaks, and Bill Gates Speaks, all from Wiley. Her articles have appeared in such publications as Newsweek, the Christian Science Monitor, the Los Angeles Times, and the San Francisco Chronicle.